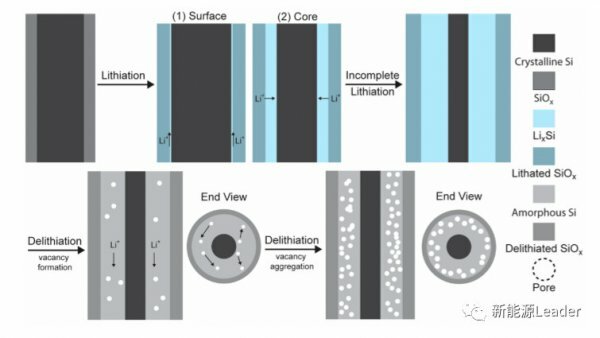 With the increasing energy density requirements of lithium-ion batteries, traditional graphite-based anode materials have been difficult to meet the needs of high-energy lithium-ion batteries, while the reversible capacity of Si anode materials has reached 4200 mAh/g (Li4.4Si), voltage platform and graphite. The material is close, it is an ideal anode material choice. However, the Si anode material has a volume expansion of up to 300% during the lithium intercalation process, although the technology such as Si nanowires appearing this year enables Si materials to withstand such large volume expansion without occurrence. Powdered and broken, but repeated volume expansion still causes the active material to lose connection with the conductive network, causing loss of active material. Surface coating is an effective method to solve the volume expansion of Si nanostructures. For example, surface coating of Si nanowires with SiOx, Al2O3, TiO2 and other materials can effectively improve the structural stability of Si nanowires. Especially SiOx coating The process is relatively simple. 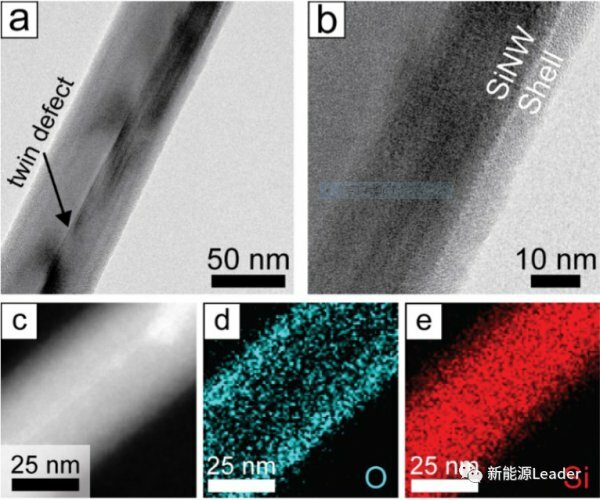 The SiOx-coated Si nanowires can be obtained only by oxidizing the surface of the Si nanowires. The TEM analysis also shows that the SiOx surface layer can well suppress the volume expansion of the Si nanowires, so the SiOx coating is A very ideal way to treat Si nanowires. However, by in situ TEM observation, Emily R. Adkins (first author) and Brian A. Korgel (corresponding author) of the University of Texas at Austin, USA, found that Si nanowires coated with SiOx were charged and discharged for the first time. During the process, a large number of micropores are generated in the Si nanowires, so that the Si nanowires increase the volume by 40% after only one cycle. Emily R. Adkins believes that this aspect and the surface SiOx limit the interior of the Si nanowires. The hole defects migrate to the surface, causing them to nucleate internally and continue to grow to form micropores. On the other hand, they are also related to the different volume expansion of SiOx and Si materials during lithium insertion. The Si nanowires used in the experiment were obtained by the supercritical fluid-liquid-solid (SFLS) method, and then heat treated at 800 ° C to form an oxide layer with a thickness of about 10 nm on the surface of the Si nanowires. Show). Next, Emily R. Adkins observed the deformation of Si nanowires during lithium insertion and delithiation by in-situ transmission electron microscopy. The following figure shows the in-situ TEM image of Si nanowires with different time of lithium insertion and delithiation. It can be seen from the figure that the lithium intercalation process starts from the surface of the Si nanowire and then diffuses to the core of the nanowire. 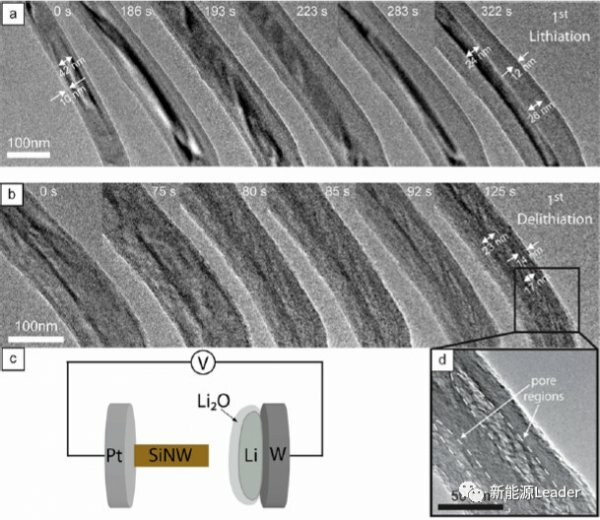 As the degree of lithium intercalation increases, the Si nanowires have a significant volume in both the length and diameter directions. Expansion, the final volume expansion reaches about 130%, and is much smaller than the theoretical volume expansion of 300%, indicating that the oxide layer on the surface of the Si nanowire prevents Si from completely intercalating, thereby effectively suppressing the volume expansion of the Si material during lithium insertion. . It can be seen from the following figure d that a large number of micropores are generated in the Si nanowires during the delithiation process, and the same phenomenon has been observed in the Si nanoparticles coated on the SiOx surface due to the existence of these micropores. Even after the complete delithiation, the volume of Si nanowires is still 40% larger than the original. Interestingly, these micropores will disappear during the re-intercalation of lithium, but will still appear after delithiation again, but these micropores The volume occupied is further increased by 25% compared to the volume after the first lithium insertion. The figure below shows that a Si nanowire in the process of lithium intercalation causes the SiOx layer on the surface of the Si nanowire to be broken due to excessive volume expansion (270%). In this case, the Si nanowire does not appear inside the discharge process. Micropores, and if there is no SiOx layer on the surface of the Si nanowire, micropores will not appear inside the Si nanowire after delithiation. Generally speaking, since Li diffuses slowly inside Si, micropores are generally not formed, and microporosity occurs only in some scenes where Li diffusion speed is fast, such as Ge nanowires or doping treatment. The Si nanowires. The calculation shows that the potential migration of holes in Si nanowires is about 0.45 eV, which is very close to the potential of the migration of Li in amorphous Si (0.47 eV), so usually before the holes form micropores. , it will diffuse to the surface of the Si nanowire, but if the surface of the Si nanowire is coated with a layer of SiOx, it will become very different, and the potential of the hole in the SiOx will reach 0.72 eV, if SiOx reacts with Li A product such as lithium silicate is formed, and the barrier in which holes migrate is further increased. Unfortunately, it is indeed observed by TEM that the SiOx layer does participate in the reaction during charge and discharge to form Li2Si2O5, Li4SiO4, Li2O. Products such as Si and LixSi, which greatly increase the difficulty of diffusion of holes in SiOx nanowires, so a large number of holes will accumulate at the Si/SiOx interface and nucleate and become micropores, along with the interface The number of micropores increases, the nucleation of micropores The length will diffuse toward the core of the Si nanowire, and finally a large number of micropores are formed inside the Si nanowire, so that the volume of the delithiated Si nanowire cannot be restored to the initial state. Meanwhile, due to the relationship between the Si nanowire and the SiOx outer shell. Different volume expansion will also generate stress inside the Si nanowire, which further promotes the formation and growth of micropores. Emily R. Adkins's research shows that although Si nanowire surface oxide coating can inhibit the volume expansion of Si nanowires during lithium insertion, it also leads to the formation of micropores in Si nanowires during charge and discharge. Si nanowires still maintain a considerable volume expansion after delithiation, which is considered in the design of subsequent Si nanowires.